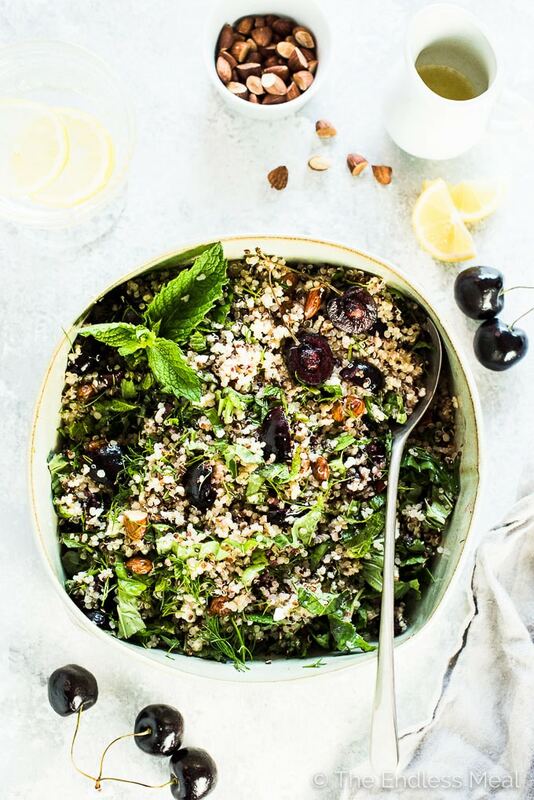 This light and fresh Summer Quinoa Salad is perfect for a hot sunny day or dinner on the patio. 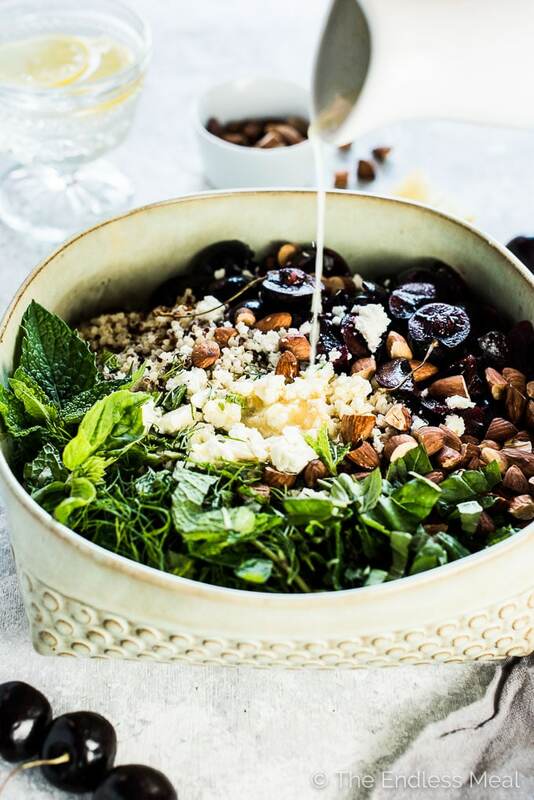 It's loaded with sweet cherries, toasted almonds, feta cheese, and fresh herbs and tossed with a lemony dressing. Leftovers make a healthy and delicious lunch. It's a healthy vegetarian + gluten-free side dish that can easily be made vegan, too. I know that the online world is rushing head first into the back to school/ autumn frenzy, but I. just. can't. do it. The sun is shining. My summer birthday only just passed. I'm burying my head in the warm beach sand and avoiding all talk of the seasons changing. Can summer stay all year long? Pretty please. 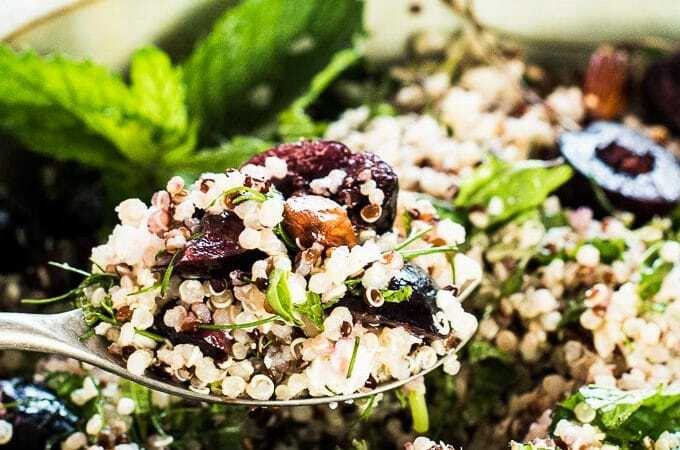 To keep summer going a little longer, I've made us a Summer Quinoa Salad. Even though you could technically eat this at any time of the year, it's light and fresh and tastes like summer. The quinoa is cooked then cooled. Hello, summer quinoa salad shouldn't be warm! Once it's cool, you toss it with a whole bunch of sweet cherries (not weird at all. trust be on this one. ), loads of fresh garden herbs like basil, mint, and dill, and a few handfuls of crunchy toasted almonds. The dressing is a take on my Lifesaving Lemony Salad Dressing. It's a simple lemon vinaigrette that has once again proven itself to be good on any salad. I owe two big shout outs to two awesome people for this recipe. Without them, there would be no summer quinoa salad. Or at the very least, it would have looked completely different. I've had the words “summer quinoa salad” written on my calendar for a while now. Last fall, when I made the Autumn Quinoa Salad recipe, I had visions of creating one for every season. Winter came then spring passed and I knew I'd better get on it before the year came full circle. The challenge of creating new recipes when you're starting with only a title is that they can often go in so many directions that it can be hard to nail down which way to go. That's what happened when I bumped this salad from early August until now. 1. My dad. (hi, dad!) Every year, he brings me fruit from the Okanagan. That's the fruit growing capital of Canada and where I grew up. This year, I was lucky enough to get TWO deliveries of cherries, straight from the orchard to my doorstep. Dad, you are the best! 2. My good friend, Gaile Guevara. This talented beauty is also one of the most generous people I know. After a carried away farmers market shop that left her with more veggies than she could fit in her fridge, she text me to ask if I wanted to take some home. Little Ava and I walked over for a visit and came home with a bag full of fresh herbs and a whole pile of fruit, too. 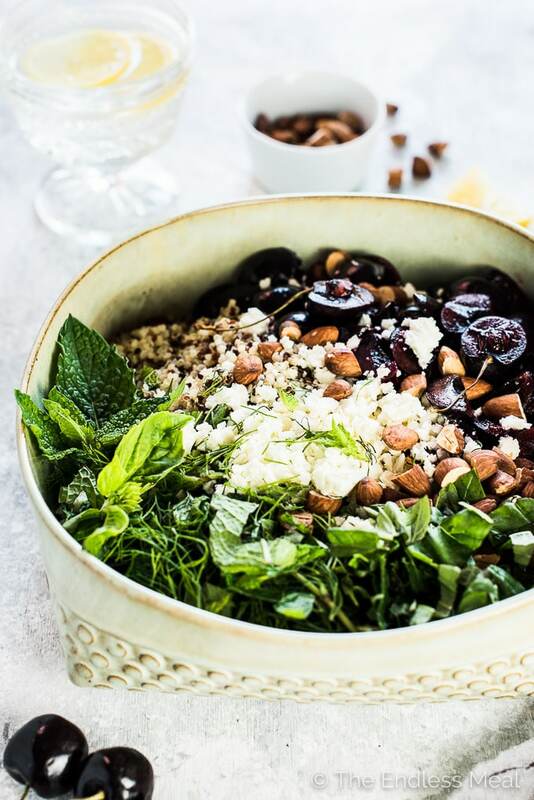 Those fresh herbs and cherries set the direction of this summer quinoa salad. In other words, it couldn't have happend without you, dad and Gaile. Place the quinoa in a small pot and add 2 cups of water. Bring the pot to a boil over high heat. Cover the pot and reduce the heat to medium-low and continue to cook for 12-15 minutes. Remove the pot from the heat, fluff the quinoa with a fork, and set it aside with the lid off to cool. Note: to cool the quinoa fast, spread it out on a baking sheet. While the quinoa is cooking, pit the cherries, chop (and toast, if needed) the almonds, and chop the herbs. In a medium-sized bowl, whisk all of the salad dressing ingredients. Once the quinoa is room temperature, transfer it to a serving bowl. Add all of the remaining ingredients to the bowl and pour the lemony dressing over the top. Toss well then serve. You want the dressing to be quite salty as it is the salt for the entire dish. The dressing should taste much saltier than you think it should. To toast the almonds, chop them first then place them on a baking sheet in your oven at 375 degrees for 6-8 minutes, or until they are light brown and fragrant. This salad keeps very well. Lunch for days! We love this salad! Sometimes we use berries instead of the cherries jsut to switch things up. We always use all the herbs cause the flavor is so light and fresh with them. Thank you for the recipe!! I’m so happy to hear you like it! And good call on switching up the cherries for berries sometimes! !